The Advanced Filtering Module is part of the core JReviews package and allows you implement a great looking and powerful filtering solution for your JReviews site. 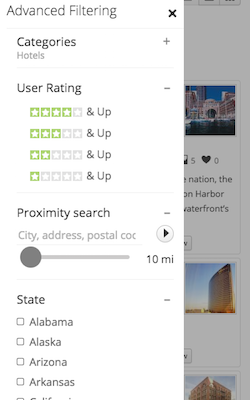 Possible filters include categories, listing types, user & editor ratings, and custom fields. You can create custom filter forms and we've made it dead-simple to use a single theme and module throughout the site through the use of display conditionals. These conditionals are based on directory, listing type and category and can be applied to individual filters or to a group of filters to simplify the markup code. IMPORTANT: The only JReviews theme positions where Filters can be published with live updates enabled are: jr-review-filters and jr-listpage-below-pagetitle. It is possible to change the layout of filters from vertical to horizontal via settings. You can see an example of the vertical layout above and the horizontal layout below. Listing Types Field - Displays a list of listing types. It should not be used together with Category Field filter. User Rating Field - Allows filtering by user rating (i.e. 3 stars & Up). Editor Rating Field - Allows filtering by editor rating (i.e. 3 stars & Up). You can add a listing author filter using the type "author" for the filter shortcode. In order for this filter to work, you also need to make sure that listing owner searches are allowed by enabling the functionality through the "Configuration / Search / Advanced Search / Allow searching by listing owner" setting. If you decide you want a different order for the standard fields, or want to add conditionals to them, then you can disable the settings and use a similar shortcode syntax as the one for custom fields. Keep reading to learn more about the different attributes that can be used for the filter shortcode. Auto detect enabled: then the category and listing type lists should be disabled (not sure if I should do it by default because users may think the settings don't work). The point of auto-detect is that the results will be automatically filtered based on the current page and that would work well with category and detail pages. For directory pages it would just filter by directory initially. Auto detect disabled, basic filters used, category and listing type lists hidden: In this scenario, the basic filters are added as hidden inputs. They are checked in this order: category, listing type, directory and only the first one that is not empty is used for filtering. Auto detect disabled, basic filters used, category or listing type lists shown: The module will automatically limit the options shown in the category or listing type lists based on the selected values in basic filters. To limit category list options only directory and category filters should be used. To limit listing type list options only the listing type filters should be used. It's hard to limit the categories based on listing type because there can be many top level categories without a listing type. Category and Listing Type filters should not be used together because selecting a listing type will not change the values of the category list. To use the Advanced Filtering Module it is important that you create a JReviews Advanced Search menu if you don't already have one, and that you make sure the Filtering Module is published to that page. When a user first uses the Advanced Filtering Module he will be taken to the advanced results page, if not already there. This happens whether you use the Live Updates feature in the module, to avoid page reloads, or not. It is through the use of the conditional attributes (i.e. show_dir, show_cat, etc. explained further below) that you will be able to have different filters appear in the search results, depending on which directory, listing type or category first used for filtering. It is not possible to include custom fields inside a controlled Field Group as filters in the module. So for example, if you have a Field Group in the Field Group manager that is controlled by one or more Field Options, any custom fields inside that Field Group cannot be used as Filters. You can enable the 'Clear all link' link in the module/widget settings if you want to offer users a quick way to reset all filter selections. However, if you want more control over the placement and display options you can also add the feature to the theme using the [reset] shortcode. You can override the text for the link and also display it as a button. If you have a category or listing type list in the form these will not be cleared because they are necessary to maintain the context for the site visitor. So we use the mod-container class by default. Module title class - Specify the CSS class used by the module title so it can be shown in the slideout panel. Similar to the previous setting, we use this setting to copy the module title to the mobile filtering panel. In our iReview template the module title class is mod-title so we use that as the default. Below we are providing an extended example you can use as reference. We are using a version of this on our demo site.